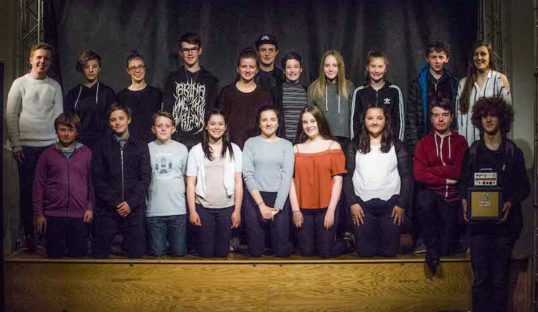 Explosive Arts – a youth theatre group from South Queensferry – return to the Fringe for the first time in five years with a play about teenage life, friendship and family life. The devised piece, although short, has some interesting things to say. The plot takes some peculiar turns, but the portrayals of troubled teenagers and their backgrounds are clearly rooted in life and experiences. A large number of the cast get at least a few lines, and while these are clearly not the most seasoned of stage actors, there is a reality about the performances that is all the more touching for lacking stagey polish at times. The depictions of futile anger and loyal friendship are notably well done, although there are a couple of points – such as when the opening and closing scenes are underscored by electric guitar – when the odd line is lost. While it is useful for all concerned to have such an impressive looking set-up technically, it does not always work in the production’s favour. Claire Hamilton and Maria Montanha’s direction is admirably clear-sighted in individual scenes, but loses a great deal in flow. Like many devised pieces, it ends up comprising a huge number of short scenes, and having a blackout and incidental music between them all is ill-advised. There are several occasions when such an interval is longer than either of the scenes before and after it, which does nothing for the cohesion of the piece. It is all the more creditable, therefore, that the thread of the story is kept so clear by the cast. The performers playing Gemma and Steven, the young couple at the centre of the story, are particularly impressive, with one physical sequence depicting their growing intimacy having a genuine impact. Some of the scenes cry out for further development– for example, those featuring Gemma’s feckless mother, or Steven’s well-meaning but ultimately no more supportive relatives. There is a palpable ensemble feel, with the cast supporting each other successfully. This, allied to clear speaking and movement – in particular the ever-tricky business of eating imaginary meals – means this has considerable appeal. Excellent performance! I was invited to come to the show after being advised by a creative bunch handing out flyers on the street! The two main characters were played exceptionally well, especially at the emotional scenes. Those two will definitely go far in the business. My only criticism is that Some characters were more developed than others! Over all great performance.